Did you know it’s not too late to Pick. Click. Give. to Doyon Foundation? That’s right – you can still add a donation from your 2013 PFD through August 31! It’s simple – just visit the PFD home page and click on “add or change your Pick. Click. Give. donation” from the right-hand column. Enter your login information and then follow the instructions. Just be sure to do it by August 31! At last count, nearly 60 people had pledged more than $5,000 to support the Foundation’s scholarship program. Donate today and help us beat our 2012 total, which came in at $5,503 from 78 Alaskans. Thank you to all of our Pick. Click. Give. donors, including our 2012 donors who are listed at www.doyonfoundation.com/static/PCG.aspx. For more information on Pick. Click. Give., visit www.pickclickgive.org. For more information on Doyon Foundation, visit www.doyonfoundation.com or contact us at 907-459-2048 or foundation@doyon.com. One of the Alaskans interviewed suggests that it should be easier for borrowers to see what their monthly payments will be after they graduate, so that they can compare it to the earning potential from their chosen degree. Good advice! Learn more about how YOU can do this with our short video: The Right Amount of Education Debt to Borrow. — Alaska Commission on Postsecondary Education. Interested in learning Koyukon Athabascan? Are you interested in learning the Koyukon Athabascan language? If so, consider signing up for the Denaakk’e Immersion Camp, which will be held Sunday, August 4 to Friday, August 9, 2013 at the Alaska Native Heritage Center’s Athabascan House. Anyone interested in learning Denaakk’e are welcome. There is no limit on age or speaking ability. Learn more at http://ayatlin.wordpress.com/2013/07/27/denaakke-immersion-camp/. The U.S. Department of Energy (DOE) Office of Indian Energy is hiring two new program managers—one located in Anchorage, Alaska, and one located in Washington, D.C. Program managers will be responsible for managing, directing, and assisting in developing and implementing technical assistance and capacity building programs for Indian Tribes, Alaska Native villages and corporations, tribal energy resource development organizations, and tribal enterprises to support energy development and electrification in Indian Country. Learn about the job duties, required qualifications, and more at https://www.usajobs.gov/GetJob/ViewDetails/347865200. The DOE Office of Indian Energy, Office of Energy Efficiency and Renewable Energy (EERE) Tribal Energy Program, and the Western Area Power Administration (WAPA), will present the next Tribal Renewable Energy Series webinar, “Conducting Transmission Feasibility and System Impact Studies,” on Wednesday, July 31, 2013, from 1 p.m. to 2:30 p.m. Eastern Time. This webinar will examine the process of assessing and analyzing the impacts, costs, and benefits of transmission line upgrades and additions. Gayle Nansel, Transmission System Planning Manager for WAPA’s Upper Great Plains Region, will highlight WAPA’s internal process for conducting feasibility and system impact studies, and Ed Weber, Senior Technical Advisor from HDR Engineering, will provide an overview of the interconnection process in the Western United States. There is no charge for the webinar, but registration is required. Register now. Find more upcoming webinars on the Office of Indian Energy website. The DOE Office of Indian Energy and EERE Tribal Energy Program, with support from DOE’s National Renewable Energy Laboratory, are pleased to offer an interactive workshop that will walk participants through five steps to help Tribes understand the process for and potential pitfalls of developing community- and facility-scale renewable energy projects. The workshop is part of the renewable energy development education and training curriculum developed by the DOE Office of Indian Energy specifically for tribal leaders, tribal executives, and tribal staff. The curriculum is also available through the National Training and Education Resource (NTER) online learning platform. The in-person workshop is an excellent opportunity to build internal capacity on renewable energy development and advance the benefits of renewable energy for Indian Tribes and Alaska Native villages and corporations. Attendees will learn how the development of a renewable energy project could further a Tribe’s goals, and hear from other Tribes about their experiences. Please see the attached agenda for additional information. This workshop is specifically designed for, and limited to, elected tribal leaders, tribal executives, and tribal staff interested in gaining knowledge and confidence to develop community- and facility-scale renewable energy projects. There is no cost to attend this workshop, but participants will be responsible for their own lodging, meals, and travel costs. Eligible attendees must RSVP by August 30 to kara.thate. If you have questions, please email indianenergy. This workshop is part of a series of in-person trainings offered as part of the DOE Office of Indian Energy’s educational curriculum. Read our blog for a recap of the commercial-scale project development and financing workshop that was held July 9-11. The workshop will be held at the University of Alaska-Fairbanks (exact location forthcoming) during the week of the Alaska Federation of Natives Conference October 24-26. The workshop is co-sponsored by the University of Alaska-Fairbanks and the Alaska Center for Energy and Power. There is no cost to attend, but participants will be responsible for their own meals. Advance registration is requested. Register now. 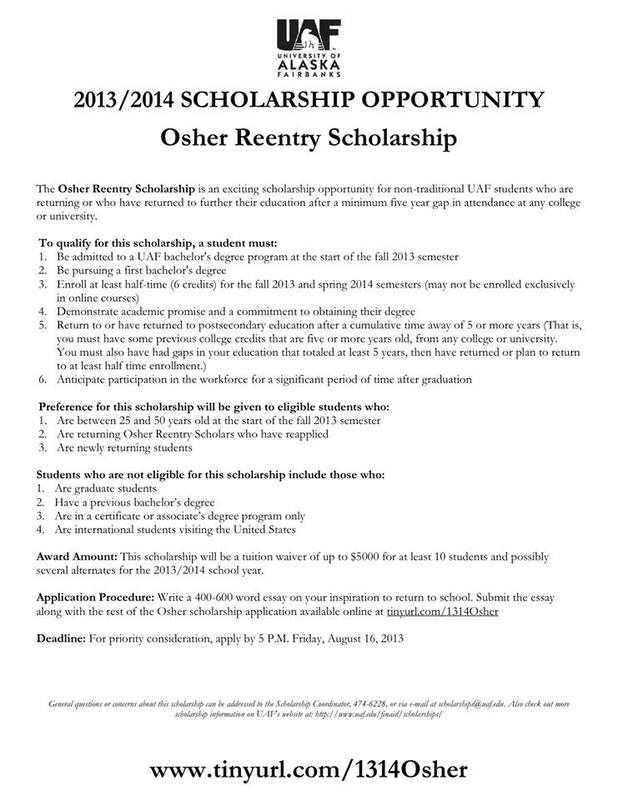 The Osher Reentry Scholarship is an exciting scholarship opportunity or non-traditional UAF students who are returning or who have returned to further their education after a minimum five year gap in attendance at ay college or university. See below link for more information on how to apply. Please see the following announcements below. If you or your students have questions about these opportunities, please contact the organizations directly (not the NSPA). National Medical Fellowships is currently accepting applications for the GE/NMF International Medical Scholars Program. This program provides an externship experience for 4th year medical students in Ghana or Kenya from March to May 2014. The award includes transportation, living expenses, and a scholarship of $5,000 per student. Want to share your scholarship or job opportunities with other NSPA members? Email Claire at czafiropoulos@scholarshipproviders.org with the information.